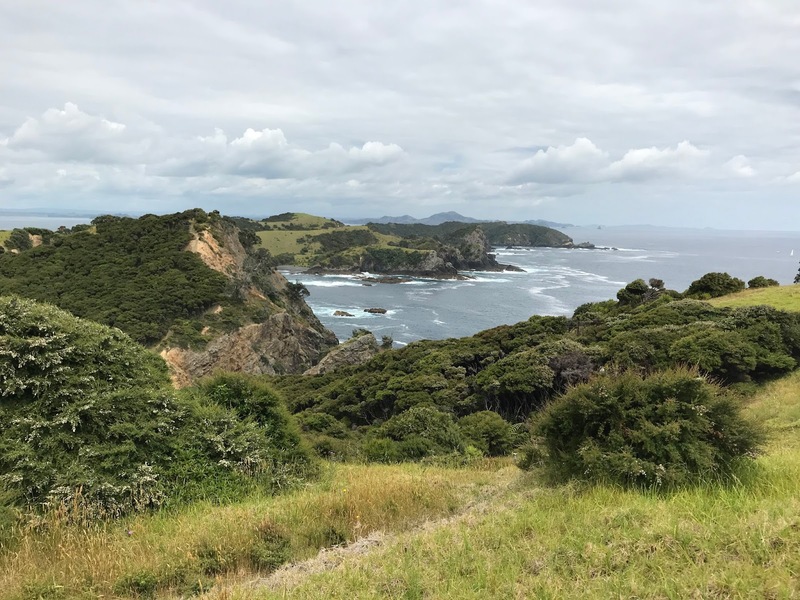 Having finally settled into our new home this year – with free-time able to be devoted to traveling rather than building projects – Michael and I considered how we would make use of his Christmas vacation days. 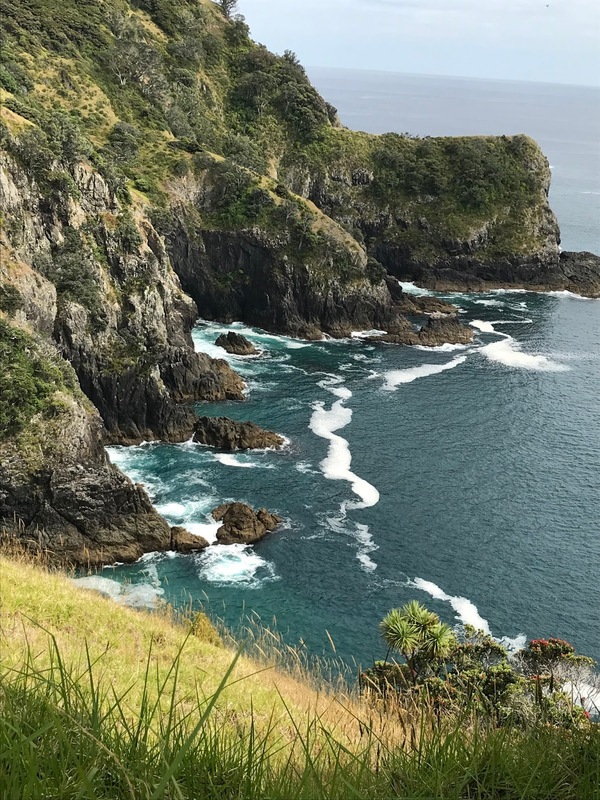 We’ve long been interested in the country of New Zealand – famous for its extensive mountain scenery, so varied and vast that it was chosen to host the iconic Lord of the Rings movies. It also happens to be in the southern hemisphere, which makes it a perfect get-away-from-winter-for-a-few-weeks destination. So after several months' planning, we headed for the airport on Dec 9th. Driving northwards towards our evening destination of the town of Ngunguru (gotta love the native names! ), I was surprised by the many palm trees and very non-LOTR, almost sub-tropical flora, we saw. Especially prominent was the just-beginning-to-flower Pohutukawa, known as the native NZ “Christmas tree”, as it flowers red around the end of December all along the islands. 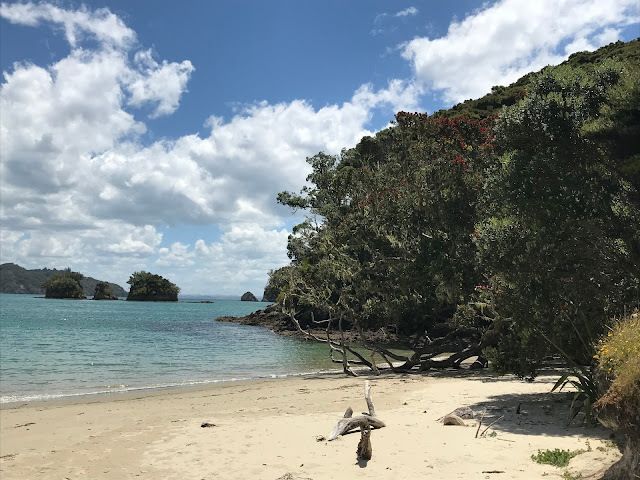 The NZ Christmas tree – just starting to have red blooms – as seen by us a few days later on our Bay of Islands trip. 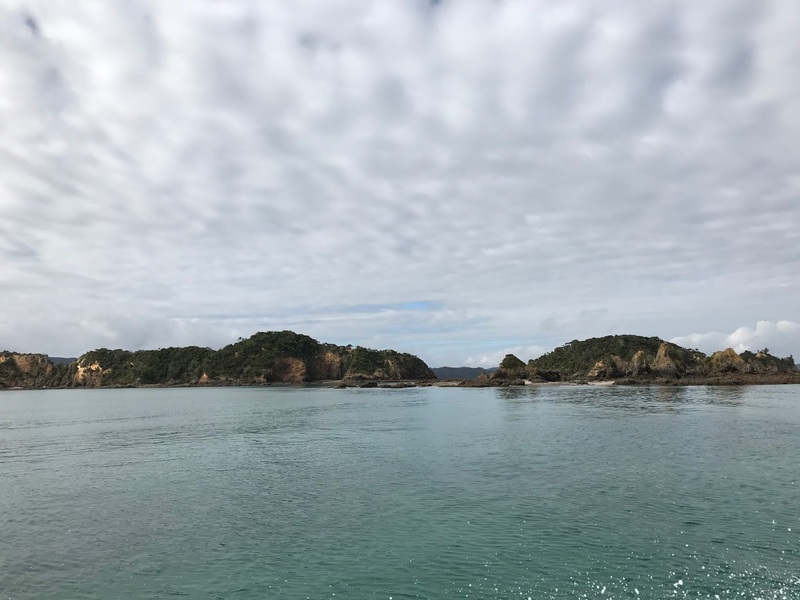 On the way to our airbnb, we stopped by the Marine Reserve of Goat Island for a quick swim, and then set out early the following day to the neighboring town of Tutukaka. 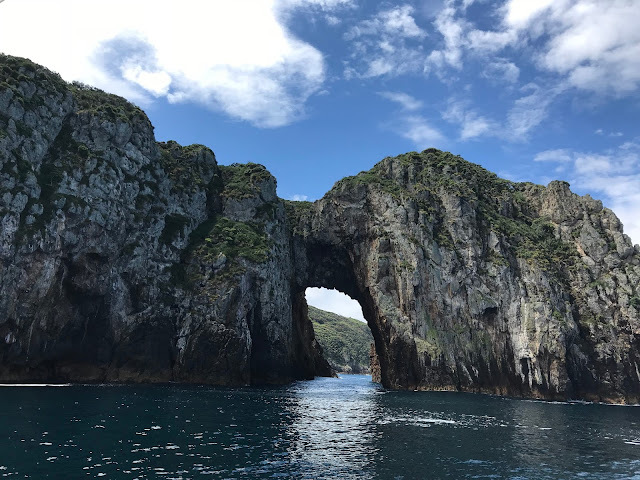 This was a day we had long been looking forward to, as we had booked a scuba-diving trip to the renowned Poor Knights Islands, rated by renowned diver Jacques Cousteau as one of the top ten dive sites in the world. 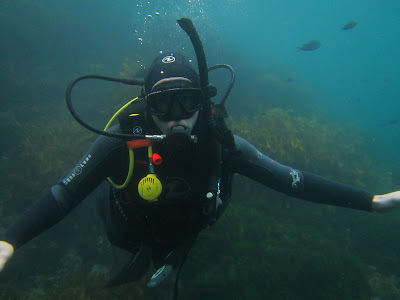 It was indeed a great experience, with lots of colorful fish, swimming above and among the swaying kelp forests. 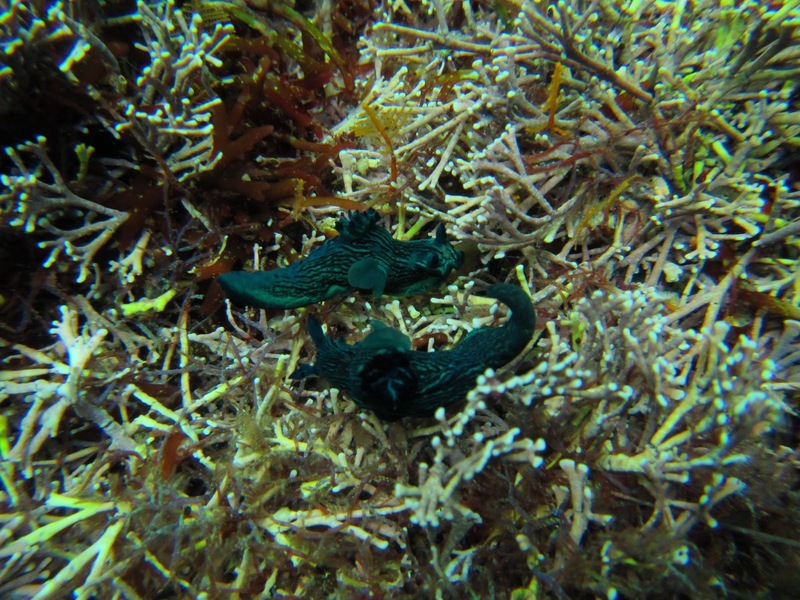 Some fish were so well camouflaged that they were hard to tell apart from the rocks they were hiding among; others were swimming in large clouds made up of hundreds of identical-looking fish. 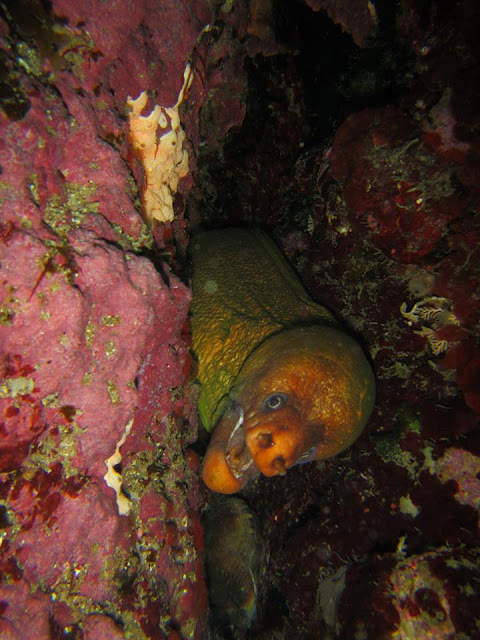 We also spotted two moray eels, and several nudibranchs: the underwater world is a very special place! While one couple talked about this being their first “cold-water” dive – requiring thick 7-millimeter wetsuits with hoods – for us it seemed like a relatively warm-water experience, unlike our last dive 5 years ago in the cold waters of the Pacific NW, where bulky dry suits have to be worn and extra training courses taken. Our scuba instructor had an underwater camera, so we have a few photos taken during our actual two dives! 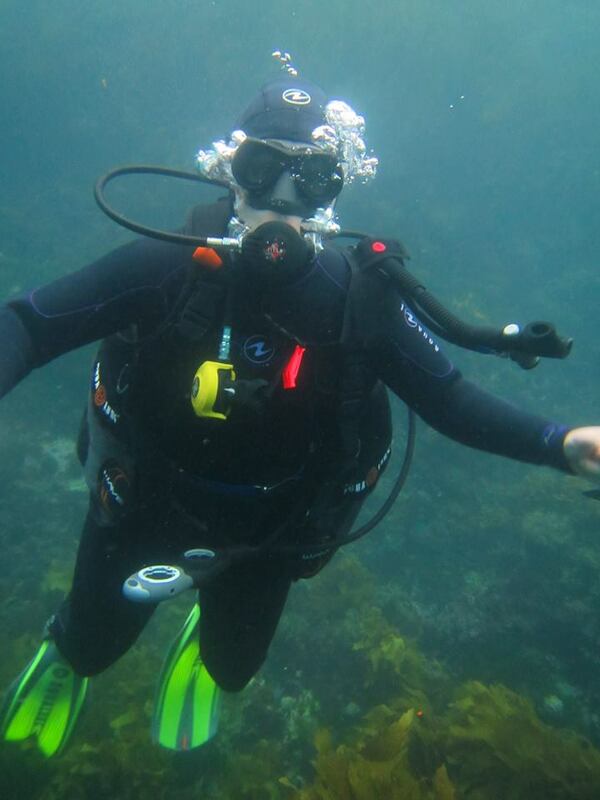 We think this is Michael (a little hard to tell with all the masks and gear!). Photo courtesy of Dive Tutukaka. And we think this is Katrina J. Photo courtesy of Dive Tutukaka. Probably Katrina again. Photo courtesy of Dive Tutukaka. In the late 1700s, the islands were inhabited by a Maori tribe with a wealthy chieftain. Thanks to the islands’ tall, rocky shores, they were easily protected against invaders. The cheiftain was a successful raider of other tribes, and – because of the islands’ strong defensive position – he was then able to stock up and hoard his growing collection of goods. Befriending (or being befriended by) Captain Cook, the chieftain received a gift of live pigs, which he then began to breed. The other Maori tribes would travel long distances and trade large sums for the rare delicacy of pork. Around 1806, one visiting chieftain sailed from such a large distance that he asked to trade for a live pig, instead. Tatua – the chieftain of the islands’ tribe – was furious at this request (if pigs could be bred, and pork bought, elsewhere on the mainland, why would anyone trouble to travel to his island and trade so extravagantly with his own tribe?). So Tatua sent the visiting Waikato away empty-handed, refusing even to sell him any pork. Waikato, in turn, was so enraged by the refusal and wasted voyage, that he seized his chance a decade later to get his revenge. As it happened, an escaped slave made his way to this other tribe and informed them that Tatua and all his fighting men were currently off raiding, and that they had left the islands undefended. Waikato attacked the islands and slaughtered those remaining, including women and children. 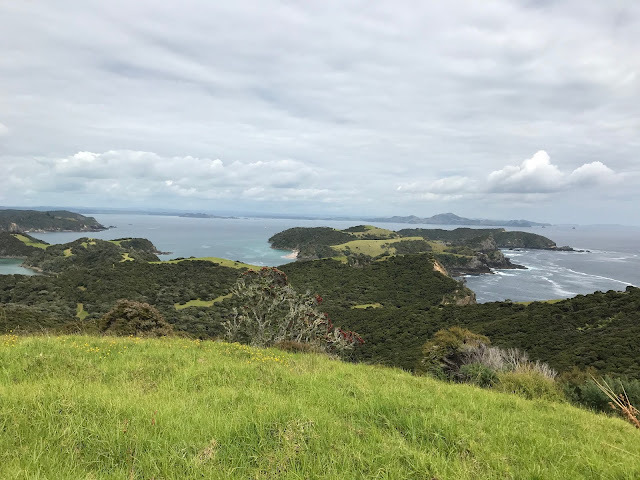 When Tatua’s warriors returned and discovered the massacre, they were so devastated that they declared the islands “tapu” – a sacred place that must be left alone (this Maori custom is the origin of the word “taboo”). 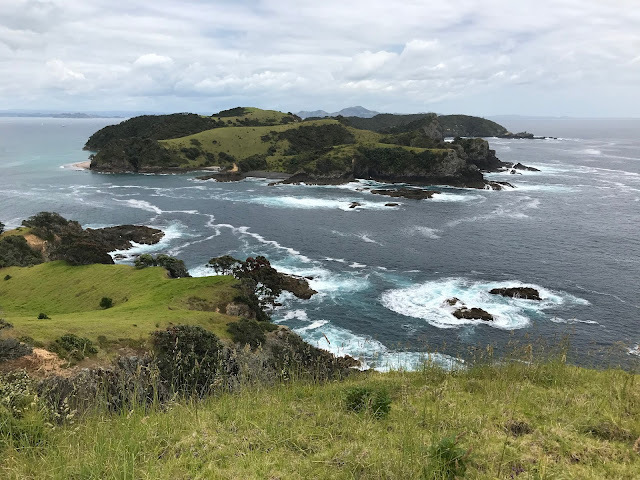 The whole tribe moved to live on the mainland, leaving the islands uninhabited from the 1820s on. Even today, no one is allowed to set foot on the islands unless they have received a special blessing. What we found so fascinating in this story is the strange twist of fate: that it's the bloody history of the islands that have kept it as such an unperturbed and beautiful natural reserve. Once the pigs were exterminated in the early 1900s, the native life has been allowed to grow without any invasive species, and the previous devastation has led to such blessedly-flourishing native flora and fauna. By the way, the meaning of the islands’ name is less clear, and it’s unknown why Captain Cook decided to call them Poor Knights Islands on his sighting of the islands in 1769. One theory suggests that the islands resemble the shape of a person lying down, and that poor knights used to be buried not in deep graves (which were more expensive to dig), but rather with stones laid on top of their bodies, and with their feet pointing in a particular direction. As such, the islands might resemble the masses of stones, covering the body of a poor knight. From a distance: feet, stomach, and head of the poor knight. The day after our scuba diving adventure, we drove up to the scenic Bay of Islands, taking a ferry ride from Pahia to one of the more remote – and also the largest – island of Urupukapuka. 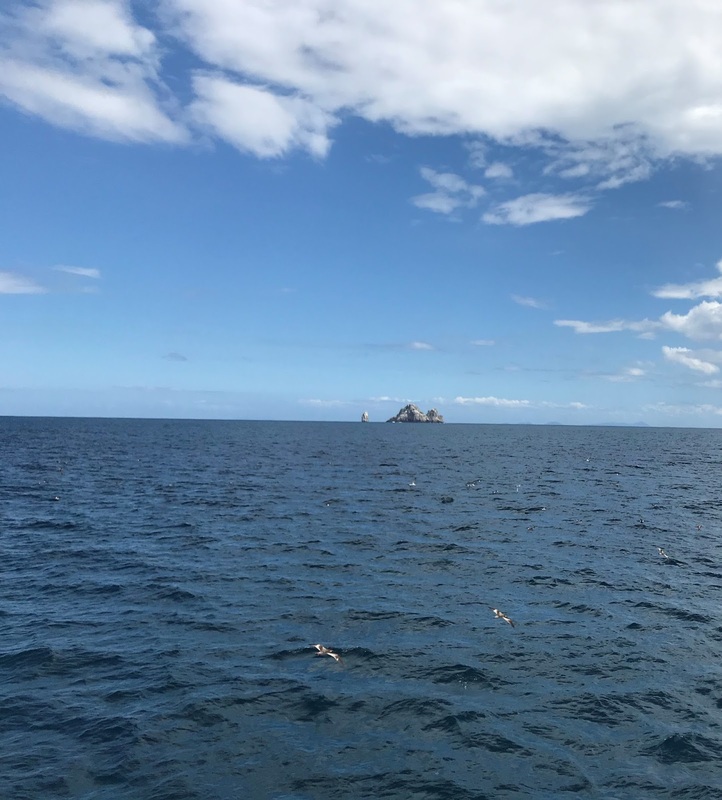 Along the way, the captain slowed down to point out a small creature: a little blue penguin, which happens to be native to New Zealand, and also the world's smallest penguin. Approaching the island. Again, gotta love the "Urupukapuka" name. 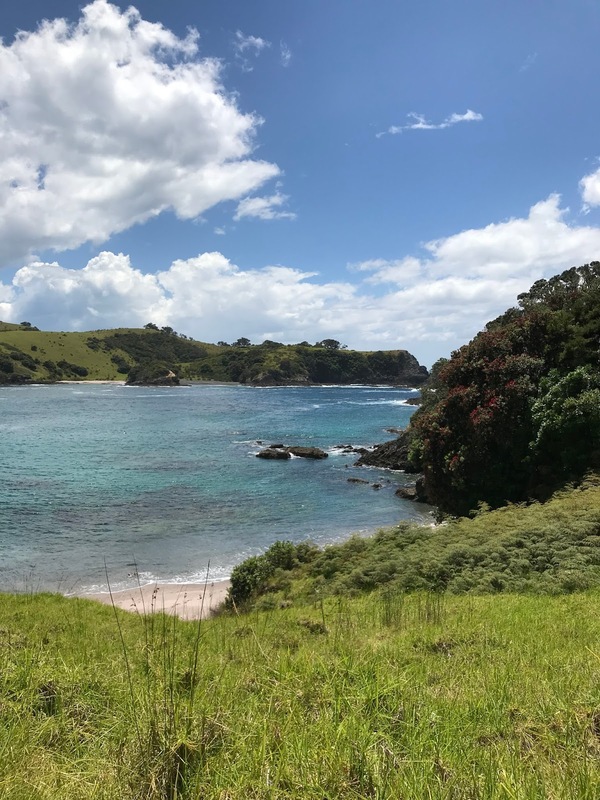 Once on Urupukapuka, we spent the day hiking along the perimeter of the island – viewing some spectacular coastal scenes, and then snorkeling in one of the small bays. 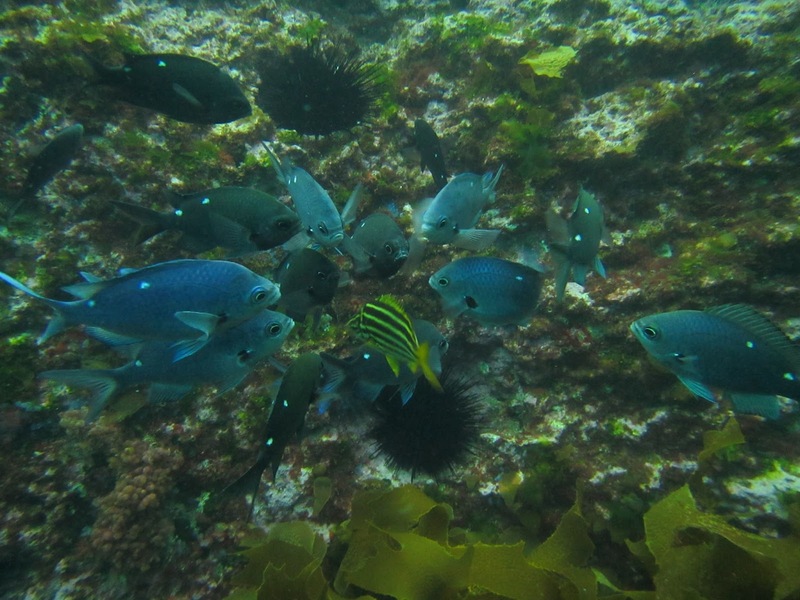 We found several underwater pockets of calm waters protected by large rock formations filled with a variety of fish. 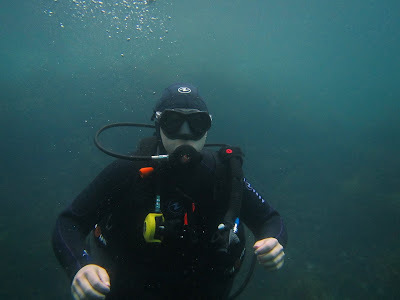 And though the underwater life was less spectacular than what we’d seen the previous day during scuba diving, it was nice to be able to swim freely, rather than feeling like an alien species in the underwater world. The following day we drove back to Auckland to catch a flight down to the south island, where the second stage of our trip would begin – our first week-long hiking traverse. Stay tuned for the next installment of the blog, about our hike in Mt. Aspiring! That eel looks pretty scary! And I think you have Katy and Michael divers mixed up. But this looks like a wonderful place to visit and has climbed up a lot higher on my bucket list!